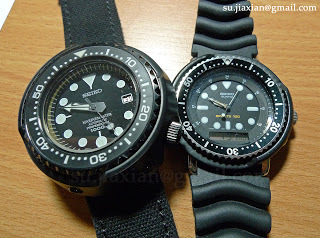 The SDBX011 1000 m automatic diver’s and the H601-5480 “Arnie”. They are apples and oranges but the familial resemblance is immediately clear. 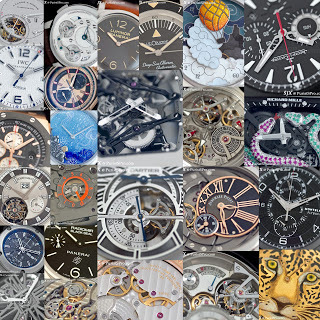 On the one hand the SBDX011 is a mid-range diver with the 8L35 automatic movement that is similar to the more refined 9S55 of the Grand Seiko. It also has a titanium case and ceramic shroud. In contrast the Arnie has a plastic shroud, replaced here with an aftermarket one in powder-coated aluminium, and a dual analog/digital, multifunction movement. The Arnie, however, has more celebrity provenance as it might have been worn by Arnold Schwarzenegger in some of his 1980s and 1990s action flicks. Also known as the Arnie is the almost identical H5558-5000 which was definitely worn in Commando and Predator. 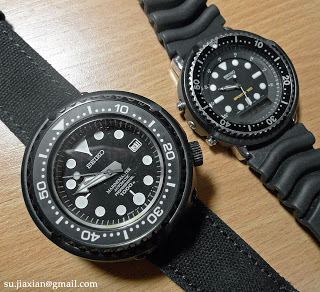 These shrouded watches are probably the closest Seiko has to an iconic sports one, albeit one that is recognised by a very small audience.